Click any Snowman postage stamp for a closer look. 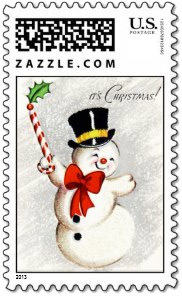 This vintage dancing snowman with his top hat and candy cane is a brings-a-smile-to-your-face snowman Christmas stamp. Could anybody be happier that "It's Christmas"? The Snowman Family along with their Scotch terrier say "Hi There" in this colorful vintage Christmas stamp. 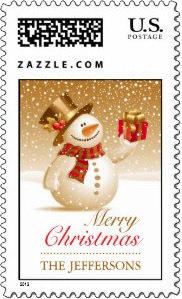 Fun personalized Christmas stamp with a snowman among gold snowflakes holding a Christmas gift. Include your name and easily change any text. 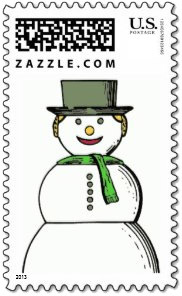 This happy blonde snow woman stamp will be a fun addition to any Christmas card motif. Simple and inviting. 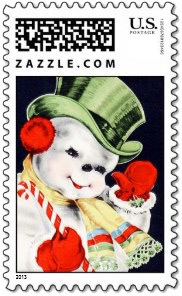 A dapper young snowman with his candy cane is out for an evening stroll on this vintage snowman stamp. A funny and cute extremely bundled up against the cold stick arm snowman. Blue striped scarf and top hat. A fun Christmas snowman stamp. 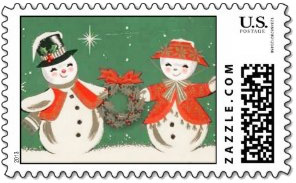 Four snowmen with colorful scarves singing carols make up this simple and fun to look at snowman Christmas postage stamp. Colorful snowman stamp featuring the snowman family. The father mother and two kids with colorful scarves and hats. Starry filled blue night sky. Cute and funny trio of snowmen looking up and the snow falling. 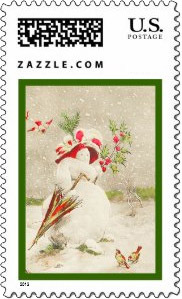 Lots of color in this snowman stamp. A cute happy snowman and his dog adorn this colorful and fun Christmas stamp as they take a walk through the falling snow. 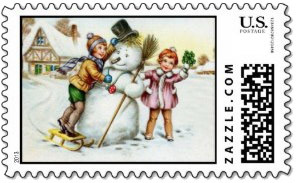 This colorful Christmas postage stamp's smiling snowman has a pipe, scarf and top hat against a pleasing purple background. A whimsical snowman stamp in soft pastels with a Christmas tree, present and a cute snowman looking up at the falling snow. A fun modern art snowman with blue scarf and stick arms. Blue background and snowflakes in the foreground. Cute snowman stamp. Folksy snowwoman in a blue hat and checkered scarf is set against a mottled blue background. Wonderful blues on this Christmas stamp. Very attractive. Popular vintage snowman stamp of the Snowman Family out for a drive to deliver a Christmas wreath. Fun retro Christmas stamp. A fun Christmas stamp for those getting married in December. Snowman wedding postage stamp has a bride and groom kissing. Nice color. This cute snowman is wearing a black top hat embellished with holly and a plaid scarf while a dusting of snowflakes falls across the bus background. A Christmas stamp with many pleasing colors. This cute snowman Christmas band stamp has the three musicians happily playing away in their colorful garb during snow fall. A snowy red background perfectly offsets this snowman on a hill and his green tree along with the text "Merry Christmas". Nicely colorful Christmas stamp. A smiling winter snowman face with warm rosy cheeks, a carrot nose, eyes and smile made of coal. A simple and cute snowman stamp. 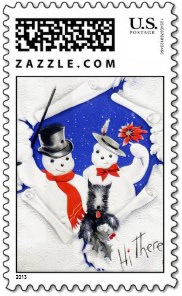 A fun snowman stamp with a boxer dog carefully sniffing out a snowman. A fun choice stamp for boxer lovers. Stylish red hat snow woman with with an umbrella and flowers. Christmas birds in the foreground of this vintage red hat Christmas stamp. A vintage snow boy and snow girl have a tumble on their sled. 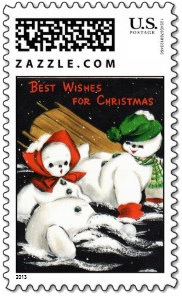 Text on this snowman stamp: Best Wishes For Christmas. Vintage snowman stamp with two children building a snowman with Christmas holly border. 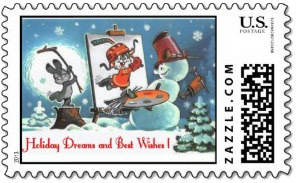 A hockey Christmas stamp with a snowman painting his rabbit friend as a hockey player. Text: Holiday Dreams and Best Wishes. Fun vintage Christmas stamp. 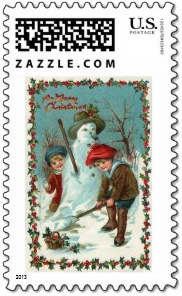 A fun snowman Christmas stamp with a vintage image of two children building a large snowman with a top hat and broom.